Frisch's Big Boy is a regional Big Boy restaurant chain with headquarters in Cincinnati, Ohio. For many years a Big Boy franchisee, in 2001, Frisch's became the exclusive owner of the Big Boy trademark in Indiana, Kentucky, and most of Ohio and Tennessee, and is no longer affiliated with Big Boy Restaurants International. In December 2018, there were 120 restaurants in Indiana, Kentucky, and Ohio. This includes 21 Big Boy stores in Cincinnati, 6 in Dayton, Ohio, and 6 in Louisville, Kentucky. Frisch's is the oldest, longest surviving regional Big Boy operator, excluding Bob's Big Boy in California, which was the original Big Boy restaurant and franchisor. Leadership of Frisch's passed from founder David Frisch to his son-in-law and finally his grandson, until 2015, when the company was sold to Atlanta-based NRD Capital, an equity fund which focuses on restaurant development. Frisch's also previously owned numerous Golden Corral restaurants in Indiana, Kentucky, Ohio, Pennsylvania, and West Virginia but after closing six under-performing stores in 2011, Frisch's sold the remainder in March 2012. In 1905, Samuel Frisch opened the Frisch Cafe in Cincinnati, Ohio. Five years later he closed the café and moved to the Norwood suburb of Cincinnati soon opening another café there. Success brought a new building in 1915 for the restaurant then known as Frisch's Stag Lunch. When the elder Frisch died in 1923, three of his sons, David, Reuben and Irving, continued operating the cafe; twenty-year-old Dave took his father's lead role. In 1932 Dave Frisch sold his interest in Stag Lunch and opened his own Frisch's Café. Frisch's Café was a success and in 1938 a second location opened, this one across from the Stag Lunch in Norwood. However, Frisch couldn't meet expenses of the Norwood restaurant and facing bankruptcy, both cafés closed in 1938. Fred Cornuelle, a local businessman counseled Frisch and provided money for a new restaurant. In 1939 the Mainliner opened on Wooster Pike in Fairfax, Ohio. Cincinnati's first year-round drive-in restaurant, it was named after a passenger airplane that flew into nearby Lunken Airport. By 1944 a second Frisch's restaurant opened, designed to resemble George Washington's Mount Vernon home. Immediately after World War II, Dave Frisch visited one of Bob Wian's Big Boy restaurants in California. Although he was unable to meet Wian, Frisch was impressed with the double-deck Big Boy hamburger and recognized the efficiency of two thinner beef patties cooking faster than a single thicker patty. Unknown to Dave Frisch, Bob Wian was disturbed by drive-in operators outside California using the Big Boy name and hamburger without permission. To maintain national trademark protection, Wian needed his Big Boy restaurants to operate in other regions of the U.S. When the two men later met, Wian offered Frisch a sweetheart deal of $1 per year for a four-state territory. The territory included the Cincinnati tri-state region of Ohio, Kentucky and Indiana and added Florida to increase Big Boy's national span. Frisch accepted and became the first Big Boy franchisee. Being the first franchisee, an ad hoc arrangement allowed Dave Frisch unique freedoms. His double-deck Big Boy hamburger was slightly different than Wian's. Dave Frisch also created his own Big Boy character: a thinner boy with reddish or blond hair, wearing striped rather than checkered overalls, presented in a running or skipping pose. Known as the East Coast Big Boy, this mark represented Frisch's and its licensees Manners and Azar's through 1969. 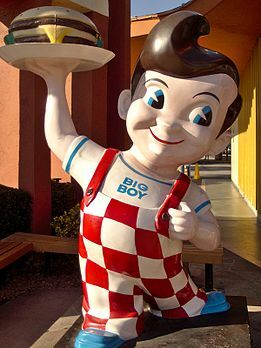 Most Frisch's Big Boy restaurants still display statues from this design, albeit usually repainted with brown hair and checkered overalls. In 2017 a redesigned statue resembling the West Coast Big Boy was introduced. Dave Frisch began selling Big Boy hamburgers in 1946 at Frisch's Mainliner Drive-In. After forging a licensing agreement with Bob Wian in 1947, the first Frisch's Big Boy Drive-In restaurant, Big Boy One, opened on Central Parkway north of downtown Cincinnati. An "East Coast" Big Boy statue exclusive to many Frisch's restaurants. "West Coast" Big Boy statues are displayed at some Frisch's restaurants. A revamped statue with a West Coast style will gradually replace existing models. David Frisch opened three more Big Boy Drive–In Restaurants in 1949 – including the first in Kentucky – and opened his fifth drive–in the following year. [note 1] By 1954 Frisch's operated 20 units in Greater Cincinnati and was subfranchising Big Boys elsewhere. In 1953 and 1954 Frisch's subfranchised Azar's Big Boy in Ft. Wayne, Indiana, and Manners Big Boy in the Cleveland, Ohio TV market. In 1955, Frisch's subfranchised northwest Ohio to Toledo brothers Milton and David Bennett, to operate under the Frisch's Big Boy name. By the fall of 1961 upwards of 150 drive–ins were in service by Frisch's and its franchisees. In 1960, 1966 and 1969 Frisch's licensed three Elby's Big Boys in the upper Ohio Valley area of Ohio. [note 2] After the death of Dave Frisch, a fourth Ohio Elby's Big Boy prepared to open in 1971, but Frisch's unexpectedly demanded much higher fees for the unit. In response, Elby's cancelled all ties to Frisch's and operated independently of Big Boy in Ohio, including in direct competition to Frisch's in the Columbus market. Protracted litigation followed as Frisch's sued Elby's  and eventually Shoney's for operating non-Big Boy restaurants in Frisch's Big Boy territory, while operating Big Boys in neighboring states. Overall, the lawsuits were unsuccessful and both Elby's and Shoney's dropped Big Boy affiliation completely in 1984. In 1972, Frisch's purchased Kip's Big Boy which covered Texas, Oklahoma and areas of Kansas. In 1988, in exchange for allowing Elias Brothers to operate (former Elby's and Manner's) Big Boys in Ohio, Frisch's received Big Boy rights in parts of Tennessee and Georgia. Frisch's ended Kip's operations in 1991, and sold that territory as well as Georgia and Florida to Big Boy Restaurants International in 2001. Frisch's released its branded tartar sauce to local grocery stores in 1960. Frisch's faced competition from numerous restaurants, both national and local. The Cincinnati McDonald's restaurants introduced the Filet-O-Fish in 1963 in an aggressive campaign against Frisch's. David Frisch died in 1970, and his son-in law, Jack C. Maier was elected President and Chairman of the Board. When Maier retired in 1989, his son Craig F. Maier became President and CEO. Larry Hatch, founder of Eat'n Park Restaurants in Pittsburgh, observed the Frisch's operation in 1948 in Cincinnati. Hatch was very impressed and quickly contacted Bob Wian about opening a Big Boy drive-in in Pittsburgh; Eat'n Park opened in 1949 as the second Big Boy franchisee. Eat'n Park chose not to renew its Big Boy franchise agreement in 1975. Alex Schoenbaum, founder of Shoney's (originally known as Parkette Drive-In) became close friends with Dave Frisch. Frisch prompted Schoenbaum to become the Big Boy franchisee for West Virginia and introduced him to Bob Wian. The original artwork for the Parkette used the Frisch "East Coast" Big Boy character, and print advertisements for Parkette would switch off, using both designs through 1954. Shoney's eventually grew into Frisch's territorial boundaries causing Shoney's to drop Big Boy affiliation in 1984. Both Eat'n Park and Shoney's, early Big Boy franchisees, continue in operation today. In 1983, Frisch's introduced drive-thru service at many restaurants, although carhops were retained at a few Cincinnati locations. It added the soup and salad bar, and also remodeled, or demolished and completely rebuild older units. Frisch's closed their locations in Florida and all Kip's locations by the 1990s. As of September 2018, Frisch's operates 96 Big Boy restaurants and franchises 24 to other Big Boy operators. Eleven of the franchised restaurants—those located in northwestern Ohio—are owned and operated by Bennett Enterprises. In 2000, Frisch's had the opportunity to purchase the national Big Boy chain, which was in bankruptcy, but declined the offer. Instead Robert Liggett purchased the national chain. Early the following year, Liggett's operation, renamed Big Boy Restaurants International made a deal with Frisch's, paying $1.2 million for Frisch's territories in Florida, Georgia, Texas, Oklahoma and Kansas, and granting Frisch's perpetual ownership of the Big Boy mark in remaining territories. The bankruptcy threatened Frisch's right to operate and franchise Big Boy restaurants but was forever resolved by the separation. The separation also relieved tensions for Big Boy, who charged other franchisees royalties and licensing fees that Frisch's was exempt from. Frisch's franchise agreement with Bob Wian, which had no expiration, required a trivial $1 per year licensing fee. On August 24, 2015, Frisch's was sold to an Atlanta-based private equity fund. The new owner, an affiliate of National Restaurant Development (NRD) Partners,[note 5] paid approximately $175 million to purchase outstanding shares of Frisch's stock. The sale ended family operation and ownership of the Frisch's restaurant chain. Craig Maier, CEO and his sister Karen Maier, Vice President of Marketing, grandchildren of founder David Frisch, retired from the company. However, both will remain active as franchisees, operating individual Frisch's Big Boy Restaurants. Other family members were not involved or were too young and expressed no interest in continuing the greater Frisch's legacy. On September 4, 2015, Frisch's Restaurants, Inc. ceased to be a listed, publicly traded company. Aziz Hashim, CEO of NRD Partners, assumed Craig Maier's position as Frisch's President. In April 2016, Jason Vaughn was hired as CEO. This was not the first dealing between the two organizations. In 2012, Frisch's tentatively sold its 29 remaining Golden Corral restaurants to NRD Holdings, the parent of NRD Partners. Golden Corral blocked the sale and repurchased the units instead. Absent since closing its last downtown Cincinnati restaurant in 2004, Frisch's returned in June 2018, opening a Big Boy restaurant on the ground floor of the Carew Tower. Frisch's was known for its "cherry" and "vanilla" Coke but switched to Pepsi products in December 2013. Frisch's cited a better deal from Pepsi, and deemed taste tests adding the same vanilla and cherry flavorings to fountain Pepsi acceptable. However, the change stirred numerous protests at Frisch's Facebook page from customers unhappy with the loss of Coke. Frisch's noted that Toledo area franchised stores have served Pepsi for "a number of years". Big Boy Restaurants International previously switched from Coke to Pepsi in 2001, similarly citing a "great, interesting proposal" by Pepsi. Frisch's new owners were aware of the controversy, and in June 2018, CEO Jason Vaugn announced that Coca–Cola was returning to Frisch's Big Boy restaurants by September. Coca–Cola reappeared at Frisch's Mainliner restaurant on July 27, 2018 with other stores to follow. Cincinnati Reds catcher Tucker Barnhart was on hand to pour the first Coke at 11 am. In March 2017 Frisch's unveiled a restyled statue. The new statue resembles the original West Coast design with black pompadour hair and Big Boy hamburger hoisted atop one arm. The checkered outfit, however, is replaced with striped overalls including slingshot as used on the original East Coast Big Boy. Now displaying a healthy torso, the Big Boy's black and white saddle shoes are replaced with cap toed sneakers. The debut statue (wearing a Cincinnati Reds uniform) is placed at the Great American Ball Park; another is planned for an unnamed Frisch's restaurant. Frisch's will then swap the new statues for existing restaurant statues in need of repair. For several decades, Frisch's has had a business relationship with the Cincinnati Reds baseball organization. From 1983 to 1998, Frisch's was a part owner of the ball club. Two Frisch's Big Boy concession stands opened in 2013 at Cincinnati's Great American Ball Park. An East Coast Big Boy statue repainted with a Cincinnati Reds uniform was placed near one stand, and in March 2017, the first of the redesigned Frisch's statues, likewise in Reds uniform, was added. In earlier years, Frisch's adaptation of the Big Boy caricature was slimmer, had blond hair topped with a cook's cap, cartoon-like eyes, slightly cherubic facial features, and wore striped pants instead of the traditional checkered bib overall-type pants used by Bob's Big Boy. In the late 1960s both characters were redrawn incorporating common elements such as checkered pants and brown hair. This Frisch's Big Boy graphic was drawn with the pompadour and lost the cook's cap but otherwise the facial features remain the same as in the 1950s. This allowed Frisch's existing fiberglass statues to continue in use, with hair and overalls repainted. It is the typical statue displayed at Frisch's today, though several units use the West Coast Bob's Big Boy statue. In 2016 and 2017 a new design and statue were introduced. Through the 1970s, Frisch's personalized the Big Boy slogan, "Frisch's Has So Much More" similarly adapting it for the Frisch's owned, Kip's Big Boy restaurant chain in Texas, Oklahoma and Kansas. In the mid-1980s, Marriott planned to retire the Big Boy character. As a publicity scheme, Marriott launched a "Should Big Boy Stay or Go?" campaign, asking customers at Frisch's and other Big Boy franchises to vote on whether or not the Big Boy should continue to be used for the trademark. Customers overwhelmingly voted that Big Boy should stay. So stop and enjoy a big Big Boy. ^ The Mainliner and Mt. Vernon restaurants – locations predating Big Boy – offered drive–in service but are not included in the number of drive–ins. This explains seeming inconsistencies of six locations in 1949 but five in 1950. From 1948 through the early 1960s the new units were primarily drive–in restaurants. ^ 1960: Morristown, Ohio; 1966: St. Clairsville, Ohio; 1969: Steubenville, Ohio. After a fire, the Morristown store closed in 1965 and was replaced by the St. Clairsville restaurant, which is often referred to as the first Ohio Elby's. Unlike Frisch's subfranchises of Manners and Azar's, (and Elby's own subfranchise from Shoney's in West Virginia,) Frisch's did not grant Elby's territory, but licensed locations completely on an individual basis. ^ Frisch's added both sandwiches later than the Big Boy hamburger. The Brawny Lad was introduced by 1954 and the Swiss Miss in 1970. ^ The salad item used by Bob Wian was a heart of lettuce salad, while Frisch's used cole slaw. NRD Holdings – founded by Aziz Hashim – are owners-operators of multi-unit franchised (primarily) fast food brands. NRD Partners, also known as NRD Capital – a subsidiary of NRD Holdings – is an equity fund of Hashim and other multi-unit food franchisees focusing on franchisors. The fund acts by either achieving a controlling interest in a franchisor or outright acquisition of a franchisor, applying NRD's expertise to improve both franchisees' and franchisor's function and value, and finally receiving return by selling individual NRD owned stores to motivated employees, selling NRD's interest outright or taking the brand public. ^ Frisch's Big Boy rights in Tennessee exclude a 19 county region centered about Knoxville, viz., Anderson, Blount, Campbell, Claiborne, Cooke, Cumberland, Fentress, Grainger, Hamblen, Hancock, Jefferson, Knox, Loudon, Monroe, Morgan, Roane, Scott, Sevier and Union counties. ^ An early undated Frisch's menu says "Big Boy Hamburger, 45¢, ... with Shredded Lettuce, Mayonnaise, Melted Cheese, Topped with Pickle". 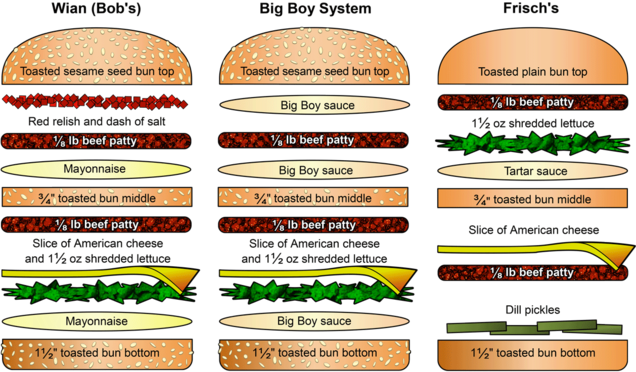 It also offers a "Regular Hamburger" and "Regular Cheeseburger", "with Lettuce and Tartar Sauce". ^ Wian's red relish was a combination of sweet pickle relish, ketchup and chili sauce. ^ "Big Boy lookalike event to celebrate Founder's Day". Fox19 Now. Retrieved October 8, 2016. On Thursday, Frisch's Big Boy will be celebrating the birthday of its founder, David Frisch, by hosting a Big Boy lookalike event. "Frisch's Founder's Day: Dress like Big Boy, get a Big Boy free!". Facebook. May 3, 2013. Retrieved October 8, 2016. May 3 marks the second annual Frisch's Founder's Day and we want to celebrate Dave Frisch's birthday with you! ^ a b c d e f g "Request A Donation". Frisch's Big Boy. Archived from the original on March 3, 2017. Retrieved March 3, 2017. This is based on the "Select Store ..." pull down menu which lists all the units. ^ a b Key, Jennie (August 27, 2018). "A Green Township Frisch's closes its doors". Cincinnati Enquirer. Archived from the original on September 4, 2018. Retrieved September 4, 2018. ^ a b c "Locations Frisch's Big Boy NW Ohio". www.frischsnwo.com. Retrieved December 9, 2018. ^ Monk, Dan (June 15, 2017). "Frisch's Big Boy to open Downtown store, ramp up expansion plans". WCPO (Channel 9). Retrieved July 17, 2017. ^ a b "Frisch's At-A-Glance" (PDF). frischs.com. Retrieved March 27, 2017. ^ a b Setters, Andrew (June 6, 2018). "Here's what's different about the Fountain Square Frisch's". WLWT. Archived from the original on June 9, 2018. Retrieved June 9, 2018. ^ a b "History of Frisch's Restaurants, Inc.". International Directory of Company Histories. 35. St. James Press. 2001. Retrieved April 17, 2014. ^ "Our Story: History". Retrieved 25 March 2017. ^ a b c "Frisch's Big Boy Makes Debut at New Drive In". Lancaster Eagle-Gazette. December 27, 1954. p. 12. Retrieved November 18, 2017 – via newspapers.com. ^ a b c "Frisch Restaurant Story ... Success". The Cincinnati Enquirer. October 7, 1961. p. 11. Retrieved November 18, 2017 – via newspapers.com. ^ a b "Frisch's Big Boy Celebrates Founder's Day May 3". [Official] Frisch's Big Boy of Northwest Ohio. Retrieved July 29, 2013. Toledo brothers Milton & David Bennett purchased the franchise rights to build and operate Frisch's Big Boy restaurants in Northwest Ohio. Bennett Enterprises owns and operates 13 family-style restaurants with drive—thru service under the name Frisch's Big Boy. ^ a b "Fire Guts Restaurant". Cambridge Daily Jeffersonian. October 4, 1965. Retrieved September 7, 2016 – via newspaperarchive.com. ^ a b "Twice told tales". Barnesville Enterprise. Barnesville, Ohio. October 6, 2015. Retrieved September 7, 2016. Fifty Years Ago – 1965 ... A fire that started in the kitchen of the Elby's Restaurant west of Morristown caused over $100,000 in damages. ^ "and ... NOW THERE ARE 3 Elby's [advertisement]". Cambridge Daily Jeffersonian. March 28, 1960. p. 7. Retrieved July 30, 2016 – via newspaperarchive.com. ^ "Advertisement: Grand opening our 16th special". Cambridge Daily Jeffersonian. January 11, 1971. p. 9. Retrieved September 7, 2016 – via newspaperarchive.com. ^ "Narcotics Evidence Is Found Illegal". Cumberland Evening Times. August 1, 1973. p. 27. Retrieved September 7, 2016 – via newspaperarchive.com. ^ Frisch's Restaurant, Inc. v. Elby's Big Boy , 661 F.Supp. 971 (S.D. Ohio, E.D. 1987). ^ "Frisch's loses appeal to stop Shoney's plans". Daily News. Bowling Green KY. April 28, 1985. pp. 10B. Retrieved June 8, 2013. ^ "History". Frisch's Big Boy. Retrieved August 2, 2016. ^ "Obituary: William D. Peters / President of Eat'n Park restaurants". Pittsburgh Post-Gazette. August 20, 2000. Retrieved 15 February 2013. ^ a b Moore, Kara (Spring 2012). "All–American Tradition". WV Living Magazine. Archived from the original on October 18, 2015. Zuckerman, David (May 7, 1984). "Shoney's secedes from Big Boy system". Nation's Restaurant News. Penton Media. Archived from the original on July 8, 2012. Retrieved April 15, 2014. "Graph of Shoney's net income since 1974; At Shoney's, details count". The New York Times. June 8, 1984. ISSN 0362-4331. Retrieved November 29, 2016. Shoney's started expanding outside of its franchise territory in 1982 by opening coffee shops without Big Boy markings in neighboring states. A fellow Big Boy franchisee sued to stop the move, but after Shoney's won a favorable court ruling in March, Marriott quickly agreed to scrap the franchise agreement for $13 million in cash. ^ "Frisch's Anniversary [advertisement]". Hamilton Daily News Journal. July 23, 1954. p. 11. Retrieved April 29, 2017 – via NewspaperArchive.com. ... with every Big Boy, Brawny Lad Steak Sandwich or Fish Sandwich you buy, you get absolutely free, your choice of a 15c drink. ^ "New Menu Features Have Been Added At Frisch's". Anderson Herald Bulletin. March 7, 1971. p. 37. Retrieved April 29, 2017 – via NewspaperArchive.com. The menu as presented has some new items that are proving popular. One of these is the "Swiss Miss" which is a steak sandwich with melted cheese. ^ Biank-Fasig, Lisa (January 10, 2001). "Ohio turf gets larger for Frisch's". Cincinnati Enquirer. Retrieved September 5, 2016. Craig Maier, chief executive of Frisch's, said the bankruptcy nearly cost the Cincinnati company its right to franchise Big Boys. ^ Kosdrosky, Terry (February 2001). "New Owner of Big Boy Gobbles Up Franchise Rights". Crain's Detroit Business. 17 (7). p. 32. Archived from the original on May 4, 2018. Retrieved May 4, 2018. Frisch's no longer is a franchisee but retains the right to license Big Boy restaurants in most of Ohio and parts of Indiana and Kentucky no matter what happens to the parent company. Liggett paid Frisch's $1.2 million to give up its rights in the other states. ^ "National Restaurant Development: About NRD". nrdiusa.com. Retrieved November 29, 2016. ^ "NRD Capital | Franchise Funding". www.nrdcapital.com. Retrieved November 29, 2016. ^ Ioannou, Lori (May 24, 2016). "The franchise king who wants to turn folks into millionaires". CNBC. Retrieved November 29, 2016. ^ "NRD Completes Growth Equity Investment in Fuzzy's Taco Shop". PRWeb. February 26, 2016. Retrieved November 29, 2016. ^ Coolidge, Alexander. "What's the future for Frisch's Big Boy?". Cincinnati Enquirer. Archived from the original on May 3, 2017. Retrieved June 27, 2015. [O]ther family members are not involved in the business and his own children are too young and expressed no interest in it. ^ Byard, Katie (March 13, 2012). "Atlanta company buys Golden Corral restaurants". www.ohio.com. Archived from the original on June 4, 2016. Retrieved December 9, 2015. ^ "Frisch's Seals Golden Corral Sale". Zacks Investment Research. Retrieved December 9, 2015. ^ Hoyle, Amanda (March 22, 2012). "Golden Corral buying back 29 restaurants". Triangle Business Journal. Retrieved May 8, 2016. ^ Sewell, Dan (August 31, 2015). "New boss of Frisch's Big Boy restaurants plans expansion". Dayton Daily News. Archived from the original on May 3, 2017. Retrieved September 2, 2016. ^ Coolidge, Alexander (July 1, 2016). "Frisch's makeover goes beyond Big Boy". Cincinnati Enquirer. Archived from the original on May 3, 2017. Retrieved September 2, 2016. ^ Brownfield, Andy (June 5, 2018). "After 14 years, it's back - Frisch's opening in downtown Cincinnati". Cincinnati Business Courier. Archived from the original on June 9, 2018. Retrieved June 9, 2018. ^ "Frisch's to Switch from Coca-Cola to Pepsi, Fans React Online". River City News. Covington, KY. December 30, 2013. Archived from the original on December 1, 2018. Retrieved April 4, 2014. ^ Cunningham, Libby (December 30, 2013). "Changing Coke for Pepsi: Frisch's makes the switch, hopes customers won't hold it against the eatery". WCPO (website). Cincinnati: Scripps TV Station Group. Archived from the original on June 30, 2018. Retrieved April 4, 2014. ^ "Big Boy Takes Pepsi Challenge, Drops Coke as Chain's Cola". Los Angeles Times. Los Angeles: Tribune Company. July 31, 2001. Retrieved April 4, 2014. ^ "Frisch's new owner: favorites to stay, Pepsi in review". Cincinnati Enquirer. Archived from the original on December 23, 2015. Retrieved December 9, 2015. ^ Strickley, Robert; Brookbank, Sarah (June 18, 2018). "Frisch's restaurants bring back Coke". Cincinnati Enquirer. Archived from the original on June 18, 2018. Retrieved June 18, 2018. ^ Brownfield, Andy (June 18, 2018). "Coca-Cola coming back to Frisch's this year". Cincinnati Business Courier. Archived from the original on June 19, 2018. Retrieved June 18, 2018. ^ Brownfield, Andy (August 6, 2018). "Bringing back Coke a big deal for Frisch's bottom line". Cincinnati Business Courier. Archived from the original on August 9, 2018. Retrieved August 8, 2018. ^ "Attention Cincinnati: Frisch's will pour its first Coke tomorrow at 11 a.m." WLWT. July 26, 2018. Retrieved 27 July 2018. ^ "Meet Frisch's Big Boy". Frisch's Big Boy. Retrieved April 7, 2017. ^ a b Weingartner-Monroe, Nancy (April 2017). "Frisch's Big Boy Loses His Checkered Pants". FranchiseTimes.com. Retrieved April 6, 2017. ^ a b Vilvens, Sheila (March 31, 2017). "Frisch's serves up new Big Boy statue". Cincinnati.com. Archived from the original on May 2, 2017. Retrieved April 6, 2017. ^ Erardi, John & Fasig, Lisa Biank (August 7, 1998). "Frisch's sells Reds share". Cincinnati Enquirer. ^ "Our History". Frisch's Big Boy. Retrieved April 7, 2017. ^ Weldon, Casey (March 29, 2013). "What's new in 2013 at Great American Ball Park". WCPO. Retrieved April 7, 2017. ^ a b Frisch's Big Boy [@FrischsBigBoy] (November 12, 2015). "Check out this old school Frisch's menu, featuring "The Double Deck King of Hamburgers"" (Tweet). Retrieved July 2, 2018 – via Twitter. ^ "Frisch's Big Boy - Timeline | Facebook". Facebook. 12 November 2015. Archived from the original on 22 July 2016. Retrieved 22 July 2016. ^ "Vintage Frischs Big Boy Menu | #440796529". WorthPoint. May 16, 2013. Retrieved December 22, 2016. ^ "A super-big Big Boy with all the trimmings ... [Advertisement]". The Akron Beacon Journal (Main ed.). May 18, 1970. p. 3. Retrieved January 17, 2018 – via Newspapers.com. ^ Searl, Laura (June 9, 1986). "Big Boy's original Bob takes it easy in Newport". Orange County Register. Santa Ana, CA. p. D4. Retrieved February 16, 2017 – via newspaperarchive.com. Wian mixed up a batch of the same pickle relish that the Rite Spot used — a combination, he said, of catsup, relish and chili sauce. He put the mayonnaise on the burger. Those ingredients, he said, make up the Big Boy special sauce recipe to this day. ^ "Matchbook Cover - Frisch's Big Boy Hamburgers". eBay. Archived from the original on April 30, 2017. Retrieved April 30, 2017. "Frisch's Restaurants, Inc. History". Funding Universe.